Ok, so your card/booklet is ready to be put together, but to protect each photo and to make it that little bit extra special I decided to create a couple of my own transparencies to put in between each page. I used photoshop, but you can use any software programme you feel comfortable with. I started by creating a file which was 4x4" in size. I was then able to work within it with pretty accurate boundaries. As I was in photoshop, it was easy to add different layers with different things on them. On one of my layers I had the text, another I had flowers, another I had leaves etc etc. I used different colours too, to match the PP I used and to make them blend in a little more. Once I was finished making my quote pages, I printed them onto transparencies. Finally I cut them into a circle using my circle template and Ultrashape cutter Xpress. To put the whole thing together I positioned each page right way up, right way around and held them together with some dog clips. Then I grabbed my Fiskars drill and drilled two sets of holes in the left hand side of the booklet. 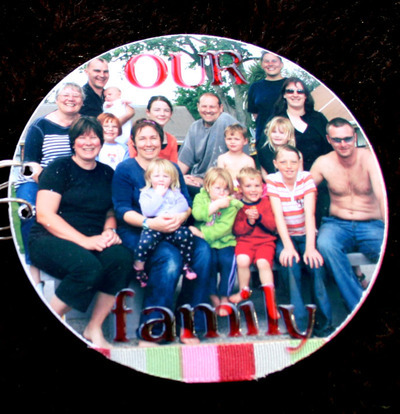 To put it all together I used some mini metal rings which I found on my (and my husbands) key rings. hehehe. 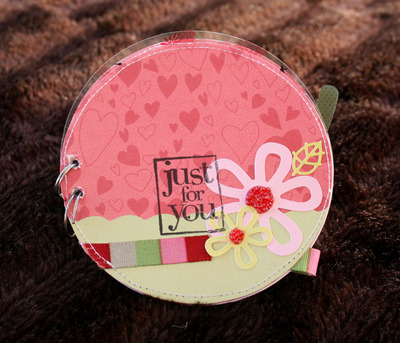 Tada, one card/mini album ready to give to your mother for mothers day. If you've got any questions about this post or the others, please feel free to leave me a message so I can come back to you with an answer. So how are you doing? 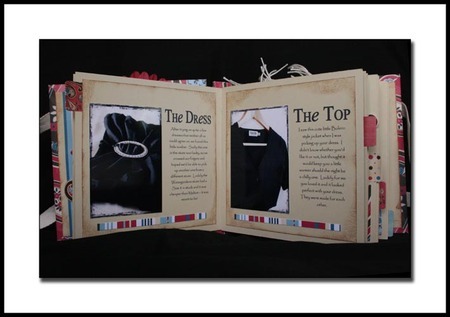 You should have 3 pieces done with the front cover and page 1 joined together. Can you see it starting to take shape now? This is where I added my greeting to Mum. I worked out what I wanted to say, typed it up in a word processing document and then printed it onto a base piece of PP. Once that was done I added a piece of ribbon across the bottom of the page and punched some hearts from my secondary piece of PP using a squeeze punch. Then I inked the edges of the hearts and attached them to the base pp over the top of the ribbon. Next I added a HG sticker flower and then I added some beads to the middle of the flower. Finally I stitched around the outside of the base pp. This page is another full photo (and this time I used one of the whole family). 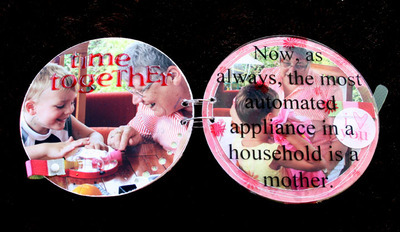 I used the Ultrashape cutter Xpress plus the circle template to cut a 4" circle from the 6x4 photo. Then I sanded the edges and placed some ribbon across the bottom of the photo (trimming the edges that overhung). Finally I added a title using some Cloud 9 rain dots and stuck the whole photo to my base pp for added strength. In my next post we'll talk about how I made and used the transparencies and how to put it all together. HI. Welcome to our workshop for NSD. 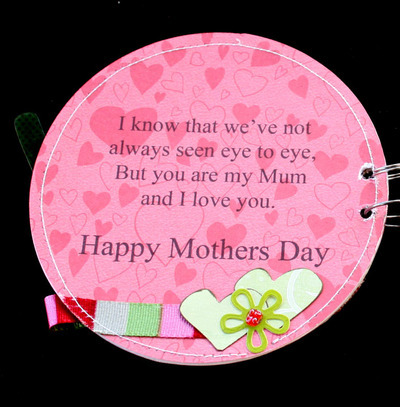 We're using lots of tools, papers and embellishments from Fiskars to create a gorgeous card/booklet for your Mum for mothers day. 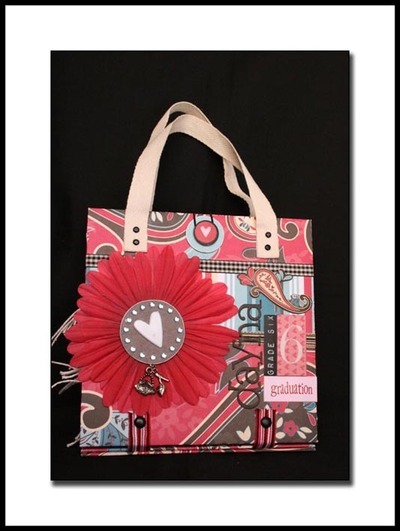 Or for someones birthday or whatever you'd like. I'll give you little tips on other items you might use instead of Fiskars products as we go through the project, just in case you don't have everything I've used. I've set the instructions up in 3 different posts 10 minutes apart. Just to make it easier to read and possibly print off should you need to. Please feel free to ask any questions in the comments sections. I'll be back online at 8-8.30pm Australian time (10-10.30pm) NZ time to answer any questions or have a chat if you're around, via the comments. Okay, to get started, you'll need to cut 6 x 4" circles from your main piece of patterned paper. I used the Ultrashape Xpress cutter and circle template to do this, but feel free to use a plate, or even make it a square design if that suits you better. First cut another 4" circle out of your secondary PP. Then using the edge of the circle template, cut scallops across the bottom quarter of that circle. Attach with scallops inside the circle to one piece of your base PP. Attach 2 x HG sticker flowers (or punch some out, or use some hand cut ones) and a leaf to the right side of your front cover where the two pp's meet. Now add some ribbon across the bottom of the circle (ending under one flower). 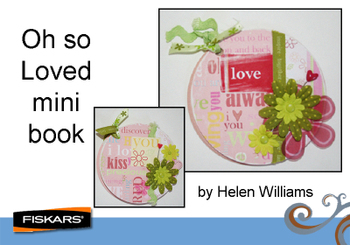 Use your stamp press (or acrylic blocks) and HG stamp to place a title over flowers/join of two pp's. Then stitch around the edge of the circle. Finally add some beads to the middle of your flowers using dimensional magic (first to stick beads down, then again once dry to ensure beads stay down). 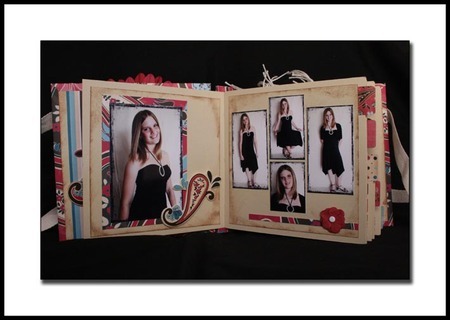 Your front cover is now complete and once the inside page is completed you can stick them together. 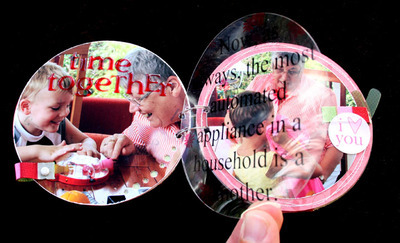 Grab one of your 6x4 photos and using the circle template and Ultrashape Xpress cutter cut your photo into a 4" circle. Sand the edges of it. 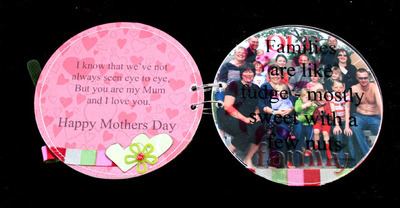 Next, use your eyelet setters (or anywhere hole punch) to punch a design along the right hand side of the bottom of your photo. Cut a piece of PP to show through the holes and attach to rear of photo. Then add a piece of ribbon to the bottom left hand side of your photo, using a brad to secure it in place. Finally add a title using Cloud 9 alpha rain dots. Stick front cover and inside page together. 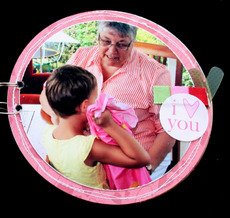 Use your circle template/plate to cut your photo down so it sits inside the 4" pp circle. Sand the edges and stick it to another piece of base pp. 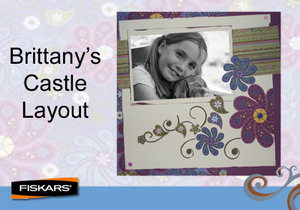 Then stitch around the edge of your pp a couple of times to get an uneven line of stitching around your photo. 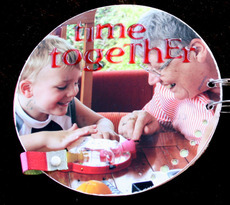 Add a small group of embellishments half way up the right hand side of your circle. I used some ribbon, a sticker and plastic heart from the HG baby range. You've now completed your front cover, and two pages. I'll come back in a short while to give you details of the next few pages and the transparencies which go in between them. Here is what you are going to need for the workshop on Saturday. I'm listing all the Fiskars products I used. If you have a look at this list and the sneak peeks you can get an idea of some alternatives you might want to use in case you don't have the Fiskars product.